As you know Sunday was Mothers Day. A very special day dedicated to all the most hardworking, generous and incredible women in the world. It was a big day for me especially as it was my very first Mothers Day. If you're a regular reader of Beauty Division then you'll have followed me on my pregnancy journey, from the big announcement up to giving birth. On Mothers Day Josh was unfortunately working so I spent the day with my family. I opened the gifts before Josh had gone to work. I got the cutest gifts. 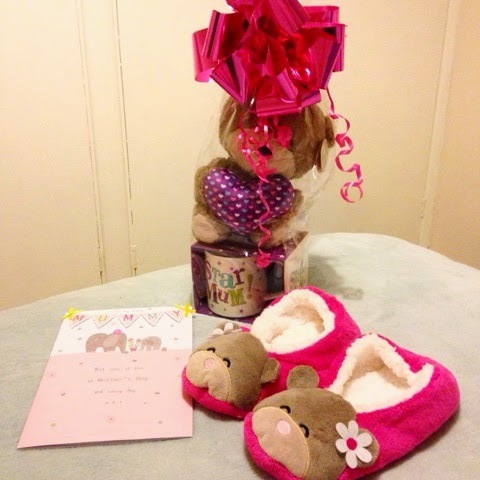 It was a teddy bear with a heart on it with a mug that says 'Star Mum' and a pair of teddy bear slipper socks. The slipper socks are unbelievably comfortable and soft. I've been wearing them so much around the house. The day I found out I was pregnant was just absolutely crazy. I remember it as if was yesterday. I found out I was pregnant when I was around 14/15 weeks gone. I had no idea until I had missed that 'time of the month'.Yeah, it's a pretty gross word that I just can't bring myself to type it, haha. My mum was a little concerned when I'd told her I hadn't been 'on' so she picked me up two pregnancy tests from good ol' Sainsburys. That very day I took the pregnancy test. I was waiting anxiously for a couple of minutes until it showed the result. I couldn't face looking at the result myself. When the full few minutes was up my mum just stared at me in shock and I just knew what the result was. It was positive. I couldn't believe it. I was in a massive state of shock. My hands were shaking, in fact my whole body was trembling and I started feeling sweaty. I had no idea how to feel. My boyfriend was at my house at the time so I shouted for him and sat him down. I then got the pregnancy test out and revealed that I was pregnant. His reaction was just, I don't know, different. The first thing he said was 'I knew it' and he had the biggest grin on his face. I knew that he'd support me through it. I didn't believe the result if I'm honest. I just thought supermarket pregnancy tests were rubbish. I took another test the next day and it said positive and I took a Clearblue test and it had a positive result too and it said I was over 3 weeks pregnant. It didn't sink in for weeks after taking them. Alfie was due to be born on the 14th of January but the little bugger couldn't wait and I gave birth to my little prince 2 weeks and 2 days early on the 29th December. He weighed a healthy 7lb 6oz. Being a mummy to Alfie is the best and most rewarding thing in the world. I am so blessed to have the most beautiful, sweetest son. I am really looking forward to the future. Seeing him grow up. Saying his first word, starting to crawl and walk, starting nursery and so on. There's so many things I'm looking forward to. Anyway, Happy late Mothers Day to all you beautiful mummies out there! I hope you were all spoilt plenty! Was it your first Mothers Day?